Former Secretary of State Condoleezza Rice’s office is denying Russian media reports that she was hired as a consultant to Georgian Prime Minister Bidzina Ivanishvili. Russian newspaper Izvestia quoted Georgian official Tedo Japaridze saying Rice promised to advise Ivanishvili’s Georgian Dream administration on Thursday, after a meeting between Japaridze and the former secretary of state. "This story is wrong," a spokesman for Rice told the Washington Free Beacon on Friday. 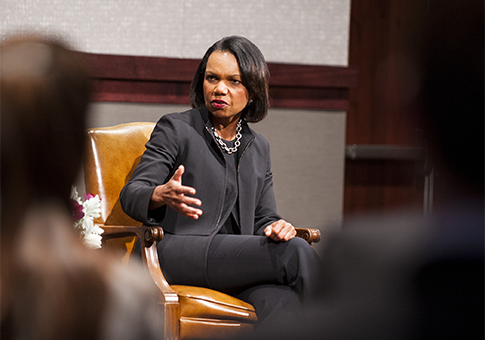 "Dr. Rice has no relationship, formal or informal, to the Georgian government or any other foreign government for that matter. She regularly sees visiting legislators, ambassadors, and other government officials from all over the world when they are in town but nothing more." "My understanding also is that Tedo Japaridze has retracted his comments," the spokesman added. Ivanishvili, who was elected in October 2012, said on Friday that he would "welcome" Rice as an adviser, but that she was not serving as one, according to Defense & Freedom Watch. Japaridze said Rice "will not have any official status and of course this information is not true. But she is observing the processes in Georgia with great interest and she remains an active supporter of our country." Ivanishvili’s Georgian Dream coalition has been stepping up its lobbying activity in Washington, D.C., in an effort to quell concerns from lawmakers that the new administration has been cozying up to Iran cracking down on the country's pro-American opposition. The Wall Street Journal reported last month that lobbying firm Patton Boggs LLP has been working to portray Georgia as tough on Tehran following reports Iran is using Georgia to evade economic sanctions aimed at curbing its nuclear program. While Georgia forged close ties with the Washington under the previous Mikheil Saakashvili administration, U.S. lawmakers have been wary about Ivanishvili’s warm relationship with the Russian government and other signs that Georgia is backsliding on democratic reforms. Ivanishvili made much of his $5 billion fortune in Russia and campaigned on repairing ties with the Kremlin. Since Ivanishvili’s election in October 2012, dozens of Saakashvili’s political allies have been arrested in what many view as an attempted purge of opposition figures. Rep. Michael Turner (R., Ohio) raised alarms on Wednesday about the developments under the Ivanishvili administration after meeting with Japaridze. "Georgia has many allies in Congress who expect the newly elected government to function as a strong democracy," ," Turner said in a statement. "The incidents of persecutions, abuse, and violence are very troubling." This entry was posted in National Security, Politics and tagged Condoleezza Rice, Middle East. Bookmark the permalink.